Every year, the Design Leadership Council (DLC) at Perkins+Will supports a competition eliciting the engagement of its younger professionals within the organization to take part in a design charrette in the hope of generating responses to provocative design challenges. In 2015, the DLC Design Competition pivoted from being an internal-facing initiative, to becoming a dynamic, public-facing event. 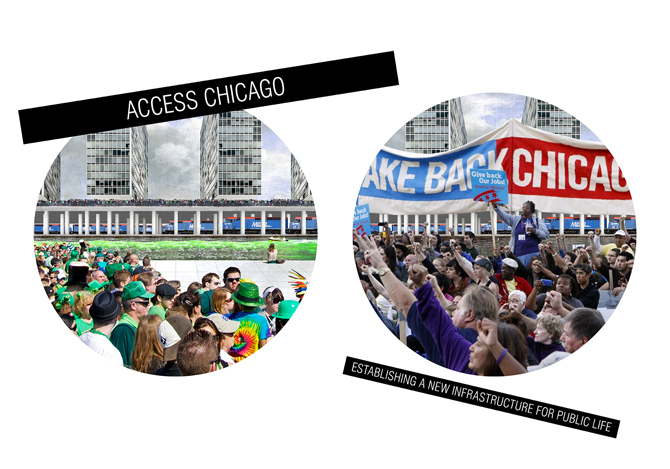 Perkins+Will partnered with the exhibition “BOLD: Alternative Scenarios for Chicago” so that their emerging designers could share their ideas and work with the public, and start a discussion on why design matters so much to Chicago. 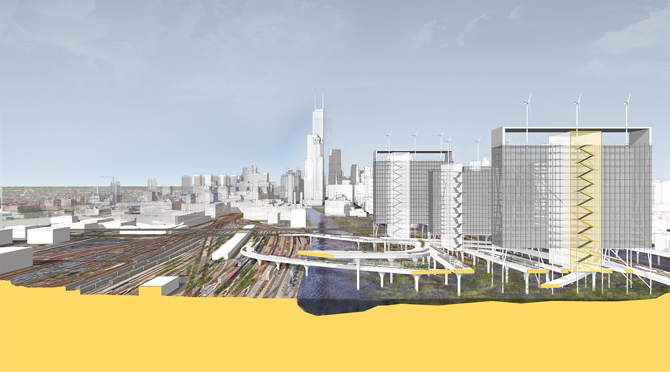 In this edition, the competition, titled “Second City’s Second Coast: An intervention along the Chicago River,” focused on a site comparable in complexity to Millennium Park and much larger in scale. The 200+ acres of land, just south of Chicago’s urban core, is one of the largest remaining areas that is looking for a creative solution to vitalize this otherwise underutilized opportunity. Over the last seventy-five years, this area on the river adjacent to Chicago’s Loop has been slow to develop, remaining for the most part vacant. With a program to be defined by the participants, each team was tasked to develop a conceptual master plan for the site and develop one component of that plan in more detail. After deliberating in front of a live audience in the Chicago Cultural Center, the jury decided on three winners and three honorable mentions for the 2015 Design Leadership Council competition. The Chicago River is a critical component in identifying the sense of place of the competition site. The river’s path has consistently been modified to accommodate urban development, while the flow direction has been changed to push pollutants to the south. However, we propose to redevelop this area with a long standing goal: purify the Chicago River. This area will not be further developed without improving the river’s water quality and direct interaction with the water will never become a reality until real, large-scale decontamination efforts are instituted. Using the old river paths as a datum, we developed a wetland and a landmark building as a system to purify the water. 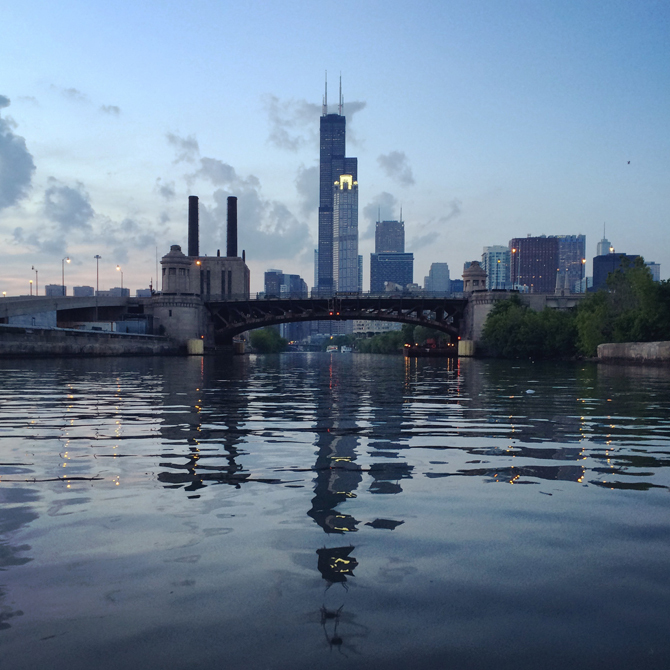 Throughout history, the Chicago River has played various roles in the process of urban planning and development: contributing as a life source, a natural highway and in last century as an industrial corridor that linked the city core to the larger regional framework. Like many river-cities today, Chicago is working to establish a balance between economic influence, quality of life, and the historical to present day industrial uses that occur along the river’s edge. 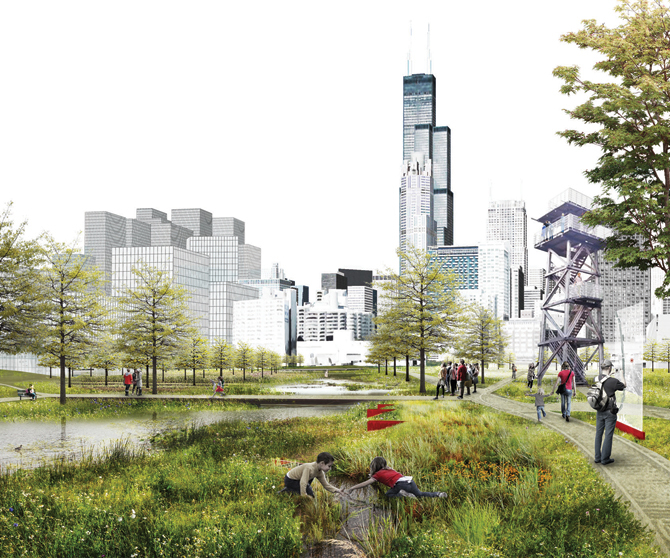 Our project seeks to reconnect a fragmented urban landscape, instill memory in Chicago’s new urban “tell”, and anticipate resiliency in order to set the framework for future succession. Through the interplay between high and low, ascending and descending, different elements of the site and the larger urban context are revealed, providing a unique perspective of the city and site. 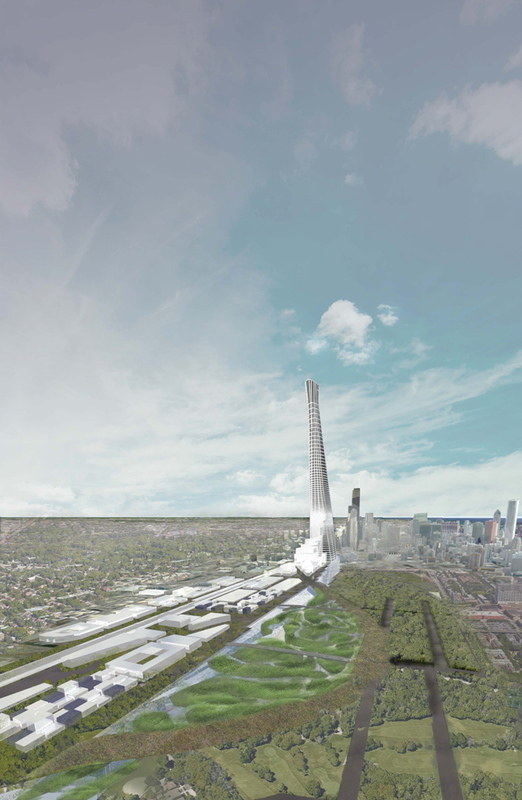 Exposing the active rail lines below the development allows people to witness industrial forces that have fueled the growth of Chicago, while also activating the site from below. Creating a wetlands park that follows the old path of the river allows the visitor to understand the sheer amount of effort that went into making the city what it is today. A build-up of density and verticality closer to the Central Business District provides amazing views from the north end of the site, allowing one to experience it in one glance from a tower’s-eye level. These design elements address many aspects of the site’s rich history, and look to the future with proposed parks and buildings. It is the revelation of historical elements and the future activation of a very important site in Chicago that help this project tell the story of succession. Historically, rail lines have barricaded neighborhoods from one another and prevented access of health services and fresh food. Using existing rail networks as well as new lines, Switchrail provides a framework to reconnect these neighborhoods. In the case study, the site just south of the Loop, an existing rail yard, is repurposed as a massive transformable park in which rail cars outfitted with trees, benches, band shells, restaurants, kayak rentals, all move along the network of rails. This dynamic view of park space brings patrons what they need at any given time – the program of the park will change from day to day and season to season. On the east side of the riverbank, a wetland helps filter water from one of the most polluted rivers in the country. Over this elaborate natural system is a network of new weaving tracks and mixed use development. The tracks connect all of the buildings and act as a dynamic pedestrian interface at the street level. The Switchrail network in Chicago will transform the way the city views unused rail lines: now as an opportunity for a small pocket park or an opportunity to connect neighborhoods. Chicago is defined by its vast infrastructures. Sitting at the junction of two great water systems, where the Great Lakes almost touch the Mississippi, the city is a space of connection – seven interstate highways, the world’s busiest airport, and the primary hub for the North American rail system. Chicago has grown and flourished because of these infrastructures. Within the city, however, the infrastructures of connection become instruments of disruption—scars in the physical and civic tissue of the city, compromising its inhabitants’ ability to access food, learning, employment, health, and engagement. This site is one of those scars: a huge tract of land that is not only inaccessible itself, but which also inhibits access between the places that surround it—the Loop, the lakefront, Chinatown, the University district, and the river. 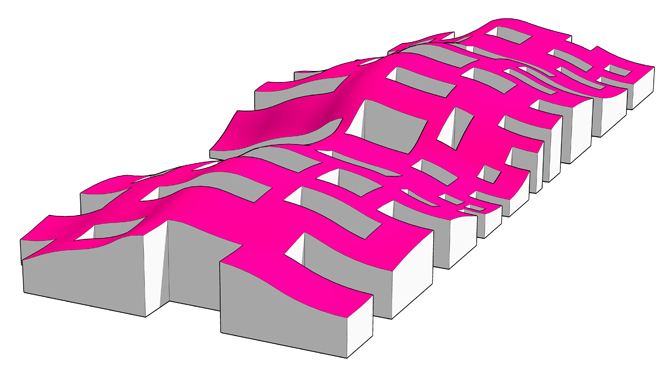 The proposal aims to increase connectivity and access at the scale of the city through the introduction of three elements; 1) a series of physical bridges and digital infrastructures which knit the site into the fabric of the city, 2) a sequence of urban rooms which juxtapose different programs, space types, intensities and durations, and 3) new social condensers which catalyze development and social action. River Colonies are terraforming communities made of pods that are dispersed in the river to seek blighted industrial zones along the river’s edge. They will attach themselves to an area and begin the clean-up process to reactivate the river into pedestrian and commercial zones. The transformation starts from within the river then moves out along the rivers banks creating a soft zone for habitat. Once the transformation is complete, the neighboring urban zones can plug into the River Colony. The pods are self-organizing autonomous mobile parts that react to their physical environments. They are composed of a series of typologies, which link together to create a community cluster. These community clusters can then link to other clusters creating a larger network of infrastructure needed to respond to its location. The existing rail yard on the West end of the site will be adapted into a solar farm. A canopy of photovoltaics will placed along the train tracks covering the field of rails and rail cars. To the East, the undeveloped 64 acre site will be programed with geothermal wells, maintaining the site as a large urban park. The captured energy from both the solar rail yard and geothermal park with processed in the former coal power station. The energy will then be distributed to the colonies along the river banks. We believe the subtle transformation of sites along the river can connect to create the ultimate river walk and new urban experience in Chicago. Formal mega projects have become too risky an undertaking in American culture. Great plans have collected dust for decades, while the form of the city continues to take its shape as an aggregation of piecemeal additions from diverse and competing interests. The result merely reflect notions of best practices that could be quantified and formalized into building bylaws, but not necessarily reflecting the values of the community. The notion of aesthetics, at once powerful yet intangible, is harder to justify controlling in a free market, as it is seen as rather arbitrary to developers, especially at a scale beyond their immediate project. Recognizing that larger economic and political forces are beyond the influence of architecture and local planning, and re-evaluating what rational community values can translate to incentives within a planning policy, this proposal explores how the profit motive driving individual private sector land development can contribute to single iconic vision on an urban scale.